Come to Quick Check Smog Check for quick- service smog checks and emissions testing. Contact us to learn what you need to do in order for your vehicle to pass the smog test. 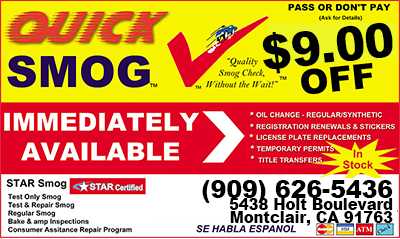 Quick Check Smog Check is a locally owned and operated business in Montclair, California. 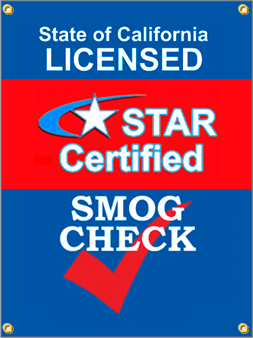 Our goal is to help vehicle owners do their part in keeping the air cleaner with our car emissions and smog testing. 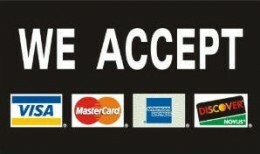 We offer affordable testing. Our staff will explain the service to you in detail so you know what to expect. If you don’t pass, you don’t have to pay! There is no appointment necessary. Stop by today, and we’ll check your car to determine whether it’s emitting emissions at a safe and low level. For your convenience, we are fluent in both English and Spanish. 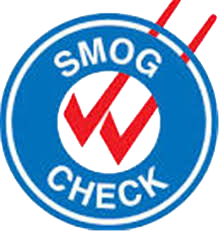 Protect the environment, as well as your vehicle, with a smog test performed by Quick Check Smog Check, located in Montclair, California. We specialize in smog checks and emissions testing for cars. Welcome to the Quick Smog Check services information page. We are the premier provider of smog testing and automotive diagnostic & repair services in the Montclair, Upland, Ontario, Claremont, Chino, & Rancho Cucamonga, California. Because our quality control standards are high, our technicians are ASE certified and are among the best in the business. The goal of our shop is to be honest and upfront with our customers and provide the best experience possible. We want you, our valued customer, to be happy. Monday - Friday, 8:00 a.m.-5:30 p.m. Copyright ©2016 | Quick Smog Montclair . All Rights Reserved.